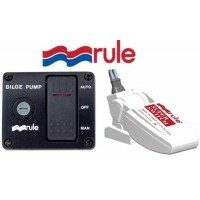 Rule Bilge Pumps	There are 19 products. 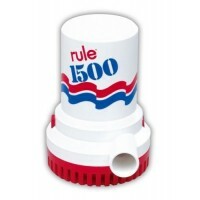 The Rule Non-Automatic Submersible Electric 500 gph / 24V Bilge Pump, 3/4" Port, 1.0 A Draw, 1.5 A Fuse, 3-1/2" H x 2-3/8" W. MFG#: 476715 Warranty: Three years. 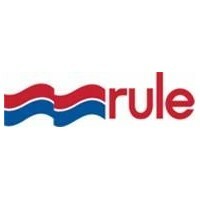 The Rule Non-Automatic Submersible Electric 800 gph / 12V Round Bilge Pump, 3/4" Port, 2.8 A Draw, 5 A Fuse, 4" H x 2-7/8" W. MFG#: 327561 Warranty: Three years. The Rule Non-Automatic Submersible Electric 800 gph / 12V Square Bilge Pump, 3/4" Port, 2.8 A Draw, 5 A Fuse, 4" H x 2-7/8" W. MFG#: 316440 Warranty: Three years. The Rule Non-Automatic Submersible Electric 800 gph / 24V Round Bilge Pump, 3/4" Port, 1.3 A Draw, 2.5 A Fuse, 3-1/2" H x 2-3/8" W. MFG#: 1245919 Warranty: Three years. The Rule Non-Automatic Submersible Electric 1100 gph / 12V Bilge Pump, 1-1/8" Port, 3.3 A Draw, 6 A Fuse, 4-1/4" H x 2-3/8" W. MFG#: 316430 Warranty: Three years. The Rule Non-Automatic Submersible Electric 1000 gph / 12V Square Bilge Pump, 1-1/8" Port, 2.9 A Draw, 5 A Fuse, 4" H x 2-7/8" W. MFG#: 375204 Warranty: Three years limited. The Rule Non-Automatic Submersible Electric 1100 gph / 24V Bilge Pump, 1-1/8" Port, 1.3 A Draw, 2.5 A Fuse, 4-1/4" H x 2-3/8" W. MFG#: 1245927 Warranty; Three years limited. The Rule Non-Automatic Submersible Electric 1500 gph / 12V Bilge Pump, 1-1/8" Port, 4.8 A Draw, 9 A Fuse, 6" H x 4-1/4" W. MFG#:215160 Warranty: Three years limited. The Rule Non-Automatic Submersible Electric 1500 gph / 24V Bilge Pump, 1-1/8" Port, 2.3 A Draw, 4 A Fuse, 6" H x 4-1/4" W. MFG#: 2426336 Warranty: Three years limited. The Rule Non-Automatic Submersible Electric 2000 gph / 12V Bilge Pump, 1-1/8" Port, 8.4 A Draw, 15 A Fuse, 6" H x 4-1/4" W. MFG#: 380065 Warranty: Five years. 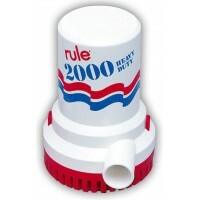 The Rule Non-Automatic Submersible Electric 2000 gph / 12V Bilge Pump, 1-1/8" Port, 8.4 A Draw, 15 A Fuse, 6" H x 4-1/4" W. MFG#: 212795 Warranty: Three years. The Rule Non-Automatic Submersible Electric 2000 gph / 32V Bilge Pump, 1-1/8" Port, 3.1 A Draw, 6 A Fuse, 6" H x 4-1/4" W. MFG#:115115 Warranty: Three years. The Rule Non-Automatic Submersible Electric 2000 gph / 24V Bilge Pump, 1-1/8" Port, 4.0 A Draw, 7.5 A Fuse, 6" H x 4-1/4" W. MFG#: 115123 Warranty: Three years. The Rule Non-Automatic Submersible Electric 3700 gph / 12V Heavy-duty Bilge Pump, 1-1/2" Port, 15.5 A Draw, 25 A Fuse, 7-1/4" H x 4-7/8" W. MFG#: 212761 Warranty: Three years. 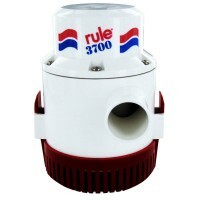 The Rule Non-Automatic Submersible Electric 3700 gpm (UL listed with 6' wire leads) / 12V Bilge Pump, 1-1/2" Port, 15.5 A Draw, 25 A Fuse, 7" H x 4-7/8" W. MFG#:1911577 Warranty: Three years. The Rule Non-Automatic Submersible Electric 3700 gph / 24V Bilge Pump, 1-1/2" port, 5.0 A Draw, 15 A Fuse, 7-1/4" H x 4-7/8" W. MFG#:442865 Warranty: Three years.